Paashe Airbrush Talon Set Compressor & DVD Kit. 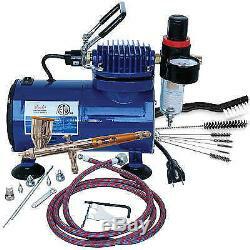 TG-100D Gravity Feed Airbrush & Compressor Package. This kit combines the Paasche double action TG-3F, D500SR compressorand AC-7 cleaning kit. The TG gravity feed airbrush is for airbrushers that require very fine detail spraying. The three spray head allow the airbrusher to spray almost any paint for most applications. The special fan aircap also allows for broader coverage of up to 3 inches. Compressor with regulator and auto shutoff. Includes 7 brush cleaning kit. D500SR Air Compressor 1/8HP, ETL Listed with Switch & R-75 Regulator. AC-7 Airbrush Cleaning Kit with 7 cleaning brushes. TG#2 TALON Double Action Gravity Feed Airbrush- Internal Mix. A-1/8-6 6' Air Hose w/ Couplings. 66mm head - gives 2-1/2 to 3 flat pattern. Ships to the contiguous 48 states. We strive to meet or beat your expectations. Item must be in original carton and in salable condition. The item "Paashe Airbrush Talon Set Compressor & DVD Kit" is in sale since Saturday, November 28, 2015. This item is in the category "Crafts\Art Supplies\Airbrushing". The seller is "artsupplysource" and is located in Chicago, Illinois. This item can be shipped to United States.